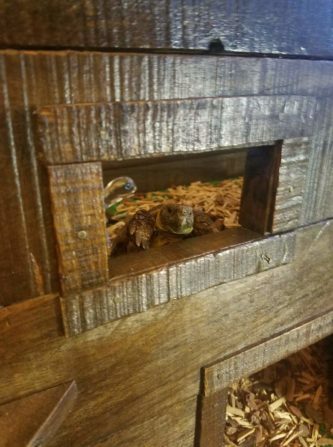 “My submission is the habitat I built for my tortoise, Digger. You’ll see that this project was the epitome of the reuse philosophy. EVERYTHING used in its construction (except for some of the screws and the stain/sealer) is reused/repurposed. I hope you enjoy it nearly as much as I did putting it together. When I decided to construct a home for Digger I knew it was going to be more than a ‘box’. An artist at heart, I am physically incapable of building anything with the ‘function over form’ mentality. Everything needs to be just as aesthetically pleasing as it is functional… and if it is particularly aesthetically pleasing, functionality is an afterthought. 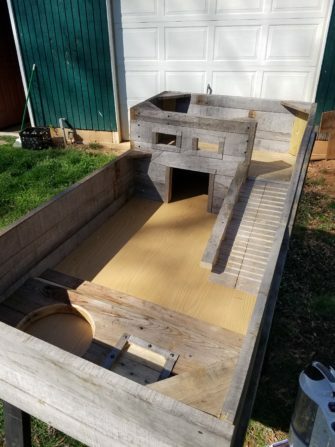 I had looked around online at what a couple hundred bucks could get me for a tortoise enclosure. 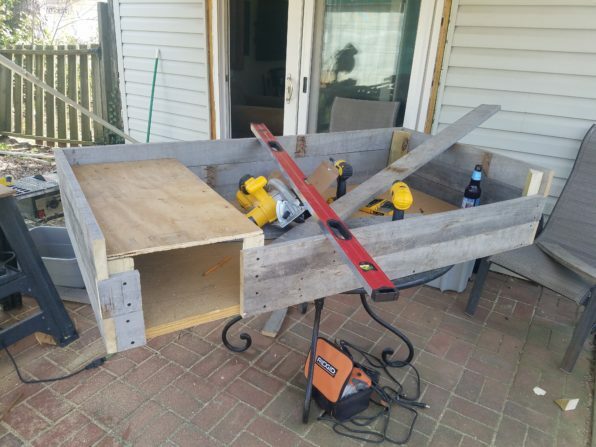 What I found was incredibly underwhelming in the design category, especially for something that was going to become a significant piece of furniture in my home. I also saw that the general layout of these enclosures were fairly uniform across the board… big area for moving around, enclosed area for hiding, ramp to second level for exploring. I thought, surely I could do something more creative with this and at a fraction of the cost (always a big motivator). Anytime I decide to take on a DIY project my first stop is almost always the architectural salvage warehouse a few minutes down the road from me. This is my happy place where I go to stand in its glorious aisles of gently loved doors, chairs, toilets, windows, antiques, lumber…etc. and wait for inspiration to strike. My home in general has an antiquey/rustic repurposed furniture vibe to it already so I knew I needed to stay in that vein with whatever I decided for this project. I considered gutting a cabinet, reusing a glass display counter like you find at a jewelry store, or even making a coffee table out of it. Ultimately I decided to build it from the ground up. 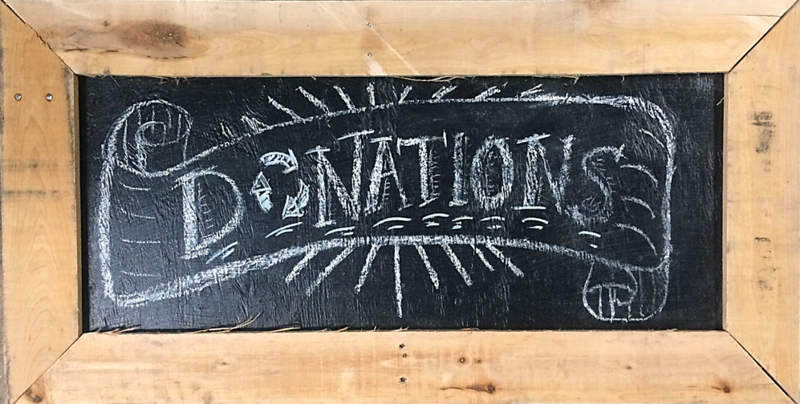 And what is the Swiss army knife of repurposing materials? PALLETS! I made my way over to the stack of pallets in the far corner of the lot and found myself a particularly lovely double long pallet with the most exquisite patina. With no blue prints drawn up, or even rough idea of how big this thing was going to be, I thought for sure this would be enough wood for whatever I ended up making. 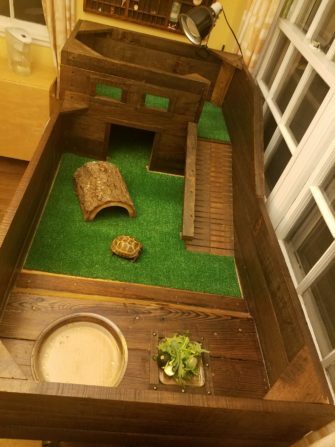 I then went inside and found myself a base for this project… an approximately 30” x 60” laminate/particle wood table top sans legs… I’d worry about the legs later, and on the spot decided 30” x 60” was the ideal size for a tortoise enclose. Man was I lucky to find it! And there you have it… I now had all the materials necessary to construct my half shelled friend’s new home for a whopping $30. So to my workshop I went with my new-to-me pallet and table top. After deconstructing the pallet I started the build. The main walls were about three boards high because… three sounds like a good number. The upper level walls are only about two boards high because… I don’t know it seemed like a good idea at the time. The ramp leading up to the second floor is somewhere between a 27 and 45 degree angle because I eyeballed it and thought that should be good enough. I cut grooves into the ramp for traction and added a beefy bannister because safety is paramount (but not as paramount as how cool the bannister looks! Are you starting to get where I’m coming from now?!) I added windows to the second level and also a raised platform for the feeding area at the other end of the enclosure. This was really starting to look like something! Once I finished the main construction of the habitat (literally without a board to spare), I added a few finishing touches. I ripped 1/8” thick strips from the sides of the scrap pieces to use as veneer to cover all the exposed fresh-cut ends and maintain that lovely patina look I had going. That was going so well that I cut more veneer strips to use as trim for all of the doorways and windows. I even constructed a fancy barn-style door for access to the first floor enclosed area. All of which was tacked into place by brass tacks left behind in the garage by my previous home owner. 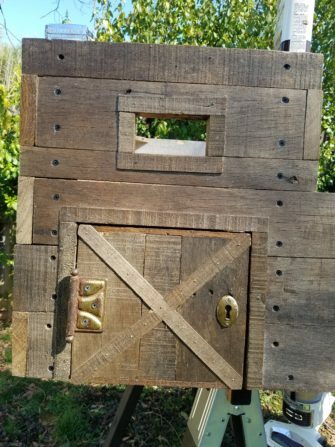 And what rustic barn door is complete without rustic antique hardware? Not this one… so back to the architectural salvage warehouse to get myself some genuine antique brass door hardware (cost almost as much as my whole project!) as well as some green artificial turf for the ground level. I added a glass candle dish for the feeding dish as well as a glass pie dish as the drinking/soaking tub – both from a second hand store. I slapped some stain and sealer on it and VOILA! A kingdom fit for royalty… or at least a tortoise, named Digger. I couldn’t be happier with how it turned out.